Melt 1/4 cup of butter in a large saucepan over medium heat. Whisk in 3/4 cup of milk & bring to a boil whisking constantly. 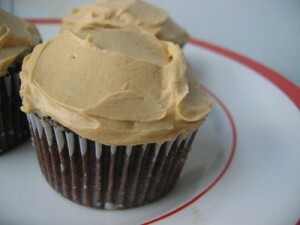 Reduce heat to low & whisk in 1 cup of creamy peanut butter until smooth. Gradually whisk in 1-16 oz package of powdered sugar until smooth. Remove from the heat and whisk in 1 tsp of vanilla extract. You are ready to spread on cakes or cupcakes.